5. Download this text file which contains rules for jarjar how to process the jars. Extract it into the temp dir. You may want to edit it and replace "ogrelab" with some other identifier like your or your company's name. in the right pane select Libraries tab and use the "Add JARs…" button to add the jars from the lib/ dir. 9. Download log4j.properties file, extract it and put it in src/ directory of your project. You are done. Be careful not to mix imports from the built-in and the new version. This entry was posted by Ognyan Bankov on 2011-08-20 at 12:40:48	and is filed under Android. You can follow any responses to this entry through the RSS 2.0 feed. Responses are currently closed, but you can trackback from your own site. That is a very nice write up. Thanks for sharing. I experienced a bug in the httpclient on a 2.3.6 device that didn't occur on 4.0. Bundling the latest httpclient with my application fixes the issue on all devices. The issue was related to overwriting request params on a per request basis. This is exactly what I was looking for! Great job! I have just tested it, it works well. i am wondering if it is necessary to add log4j jar? If you don't include log4j.jar you will get warnings at build time. It is not fatal but is annoying. All in all, please note the first sentence in this publication. It is recommended to use http://code.google.com/p/httpclientandroidlib/ instead of the method described here. Thanks for your quick response and your advise! Thanks a lot, this is exactly what i was looking for. Your blog was a godsend. 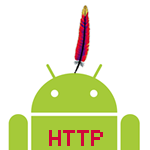 I can't believe google refuses to give us a support library for Apache HttpClient.